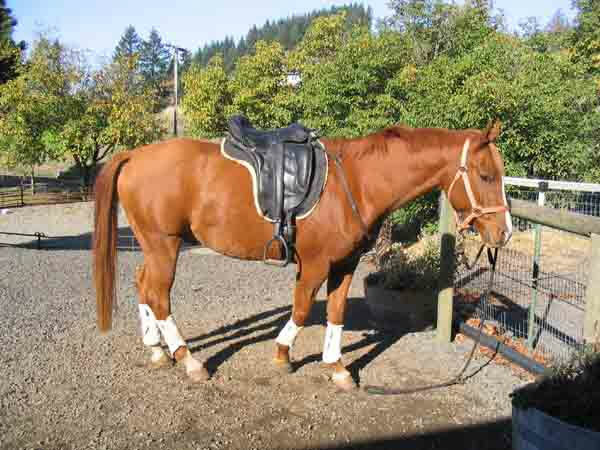 I have spent two years searching for a saddle to fit my asymmetrical, very wide Arab gelding. I even had a saddle custom made for him and that was not successful. Finally, I came across the Sensation dressage saddle and my horse loves it. It does not slip off to the right side like everything else I tried. He moves well in it and his back is no longer sore and he is “bump-free”. It is a very comfortable saddle to ride but it has taken some time to get used to the difference between a tree-less saddle and a conventional tree saddle. Now, I know I could never go back to a conventional saddle. I do dressage and trail riding and jump the occasional log on the trail. Thank you for all your patience and wisdom, it has been a pleasure working with you. I would highly recommend you to anyone having trouble fitting a saddle to their horse. You not only helped the horse but the rider as well.